I have a project where i'm using my raspberry pi for. i was using a pi Zero for this. It was all working fine until yesterday, when i tried to power it and somehow it died. On the pi Zero there is no power led, so all i saw is that it didnt start booting. Also it got pretty hot pretty fast around the main chip. When i hook the usb port up to a bench power supply the voltage drops from 5v to 2.5v. using a normal usb power supply also gives 2.5v off the 5v gpio and around 1.4v from the 3.3v line. So i guess, the main problem is that the parts get a power level thats too low, but how does that happen, a short somewhere? Something else? Can someone please help me? I can measure out components with a multimeter and i have a decent soldering iron here if needed... The main problem is, i ordered a new PI zero but i want to figure out the problem before i connect it to prevent another dead PI. 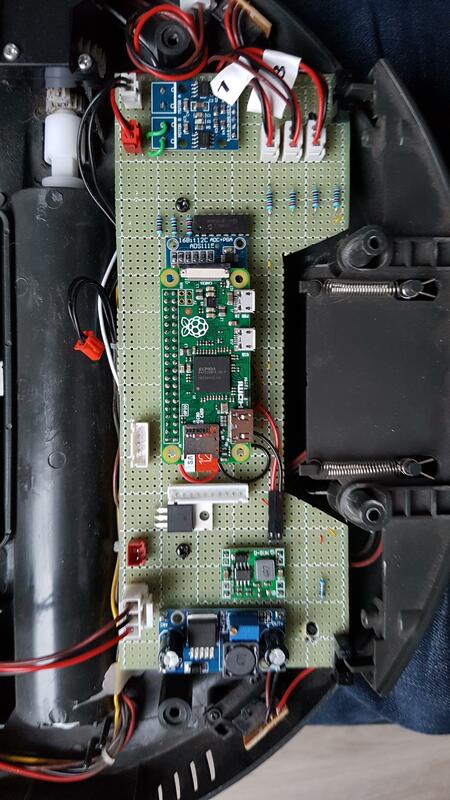 If both your pi's died when you connected some external components to the GPIO then what you connected has to be the suspect for the cause. either you have a short circuit on your external set-up or it is drawing to high a current from 3.3v or 5v, or you are putting more than 3.3v on to the GPIO. you would need to provide more details including photographs of what you connected for us to be of more help. Alternatively there is a problem with the wiring to the GPIO. Most of the GPIO pins are 3.3V and are not safe to connect directly to 5V. Doing so can cause the syptoms you are seeing. There are other possibilities (something conductive caught under the board, random failure, etc) but these are unlikely to affect two boards. No problem, i'll supply some more info. 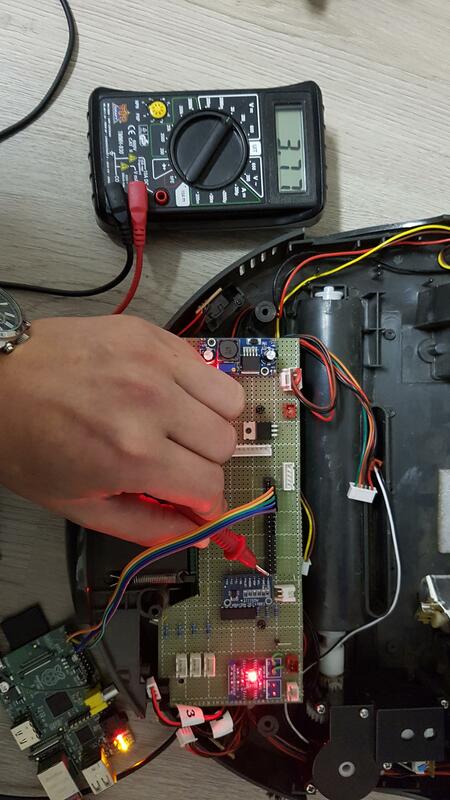 I'm building a Robot Vacuum. Or actually replacing all the electronics in an old robot vacuum. I have some photos from when it still was working. Didn't change much afterwards. I also measured all the (gpio) pins on the board side without the raspberry pi connected between ground and every pin. There is no short between ground and any pin, i think i also tried between 5v and every pin, also no short. So, what can i test and what can i do. And is there a easy way to add some protection to prevent this from happening again? Yes, good question. just to prevent any problems there i soldered a usb cable to power the PI a+ via the normal way, via MicroUSB. Fuse didnt seem to be the problem as it still measures infinite resistance. Also, after 1 day of resting it it still seems dead when powering it via a normal usb PSU. I also think it's somewhere in the GPIO, but i don't know where and can't find a short somewhere. 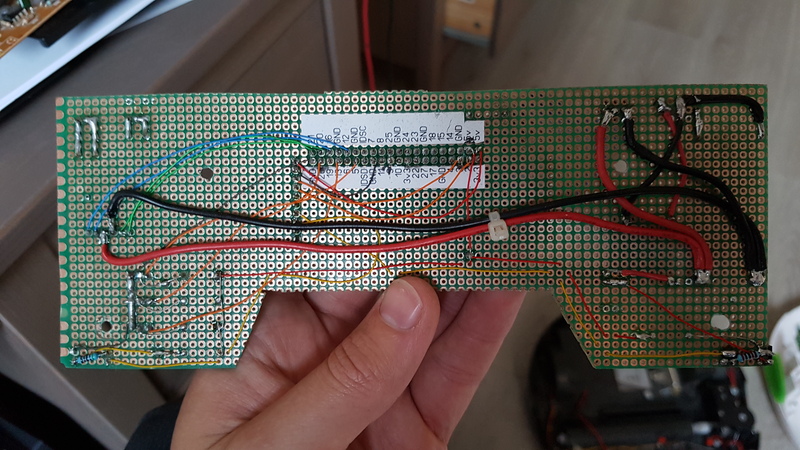 Well, apart from the fact that I can't correlate the schematic with then actual wiring for the supply to the 10V step-down, have you checked that the voltage out of the 5V step-down is correct without a Pi (or anything else) connected? Similarly for the 10V, though that shouldn't affect the Pi unless there is another error. If it was working previously, review EVERYTHING that you added, reworked or changed since then. But is there something i can do to revive the PI's? Even if it's just to be able to use them as test models to try and fix the current problems. So for example, short some stuff out to get it working again. Edit: I already ordered 10 schottsy diodes so i could place them at least between every output gpio leading to a MOSFET. At least to prevent current flowing in the wrong direction, but would that be enough protection...? Small update from my part. When i up the amps on my bench power supply the voltage also rises, but it still is grabbing max current. For example, at around 1.5A the voltage level is around 4v. But... it actually uses 1.5A or whatever i give it, that doesn't seem good to me. If there was an overvoltage (which seems the most likely) the Pi0 is probably irretrievably dead. The PiA+, however, may just have a short-circuit on the protection Zener diode (D5, see schematic). Test the Pi with it removed (do NOT connect any GPIO wiring, just the minimum screen/keyboard/mouse for testing). Note that another "accident" while D5 is removed will be fatal to the Pi, so order a replacement (or three ) and fit it before resuming testing. Fot protecting GPIO outputs, a resistor in series minimum 1K, preferably more as long as the drive is low current (as with a MOSFET gate or transistor base), is adequate. Ok, so a resistor in series would limit the current enough? And how to prevent overvoltage? A Zener diode maybe? And also, i have 10 schottky diodes on the way, should arrive this week. Would it be of much use to put those between every gpio i use? At least to the output pins to prevent current from flowing in to these GPIO pins while i use them as output only? If the current is limited, each GPIO has clamp diodes to prevent out of range voltage. A zener is unnecessary. A diode in series will only protect from one polarity, not both. It also means the the output can only "pull" one way, so switching a FET off may be a problem if the diode prevents current back into the pin. An external pull-down for the FET gate would be required. Ok, i'm trying to read and understand this. You're saying all GPIO pins already have clamp diodes? Also on the zero? So overvoltage is impossible? So only a simple resistor on every channel is all it takes to protect them from situations like this? And about the mosfet, i already soldered a 10k pulldown to ground on every mosfet because it was closing it's gate while the pi was booting (until my program sets the GPIO pin to output and low). I'm saying that a high enough value of series resistor will limit the current from a "reasonable" over- or negative voltage to a value that prevents the clamp diodes burning up. But I do not know what clamp diode current is safe, or the safe time for any given current. A simple resistor is normally regarded as sufficient protection for short periods of accidental connection to 5V or even 12V. As always, it is a matter of balancing cost and complexity (bad, it leads to its own faults and problems) against the risk and the security required. YMMV. ok thanks! I did some tests and made some photos this morning, i hope you or anyone here can give me advice in what is normal and what not. And this is the rear. I tested every point between ground and the pin to measure the voltage. On the last image you can see my test setup. As you can see i only connected the first 5 pins to the raspberry to supply GND and 5v. (and connect gpio 14/15 for no real good reason). I don't think putting 4.5v on any gpio pin will do you pi any good , it may survive for a while but eventually its libel to do some damage. all this put together is probably what killed your pi's. Yeah, thats strange to me aswell. How did the 5v get so low... Is that a sign that i'm pulling more current then the power supply can actually handle maybe? There are diodes that clamp the GPIOs to the 0 - 3v3 range, but they're only parasitic diodes, and can only handle μA -there's a recent post by an RPi engineer which gives more information, I just can't find it at the moment. Whilst it may seem that a Pi is surviving such maltreatment, once damage to a GPIO has been done, over time the localised heating caused by the damaged bits will damage more bits. The snowball effect will ultimately cause the SoC to fail. Whilst your photos are quite good, it may be helpful to provide a proper schematic. I find it difficult to work out what's connected to what, even on the board layout that you're attempting to emulate. With regards to the 5v problem. 1. what voltage do you get on your 5v rail without the pi connected ? 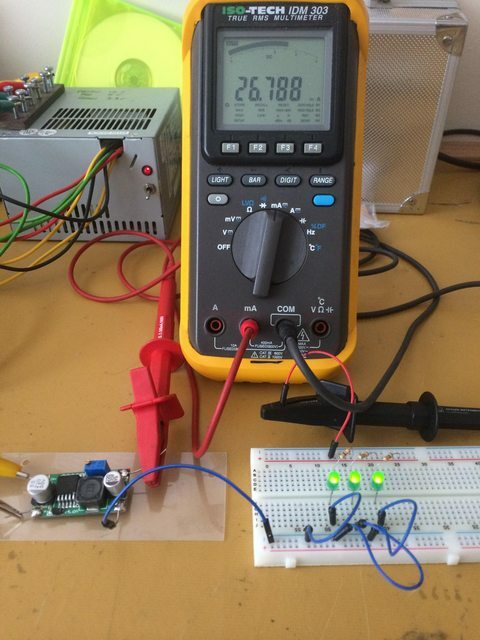 2. put an amp meter on the output of your dc-dc converter and see what current is being drawn, compare this to what your pi is actually drawing. 3. check the rating of your dc-dc converter and see how it compares to what you are actually drawing. its just basic testing but it will give you so indication of what's going on on the 5v rail and it might point what's causing the problem, be it an under rated dc-dc converter or an overload condition and possibly a short circuit even one with some resistance. Having looked for the dc-dc converter you are using for your 5v they seem to claim 3A capacity, sorry but I don't believe it , I use the other dc-dc converter you are using to power my pi's when using a battery and from my own testing they will only supply 2A reliably, so I cant see the smaller dc-dc converter being able to supply 3A reliably. It was around 5v, 4.98 if i'm correct. Don't think i really understand what you mean. How to find out what my pi is actually drawing? Well, i agree it's probably not 3A, but a Raspberry pi Zero doesn't use that much so i assume it should be able to handle around 1A. If you look at my schematic, i don't power that much also, it's 3 leds, 2 opto-isolators, a few mosfets, a motor board (h-bridge) and 2 ADC modules. Ok, how about the pins that register 3.6v? Those are coming from the MOSI/MISO/etc. from the MCP3008 module that's powered with 3.3v. Is 3.6v ok-ish? or can i put some resistors in series on those channels to prevent problems? That is not a schematic. I would consider that a bit low if you had no load on the dc-dc converter. I would expect to see 5.1-5.2v no load. So you can see we have the negative of the dc-dc converter connected to our load in this case the LED's which represent you pi. but we have the positive output connected to the red lead on the meter which is plugged in to the mA socket on the meter and the black which is plugged in to the com socket on the meter connected to the positive on our load. with the meter set to mA and every thing switched on you see that the 3 LED's draw 26.788 mA. now you pi will draw more than that and looking at the meter in your pictures I would use the 10A dc socket and setting on your meter. with regards the dc-dc converter yes 1A might be a reasonable expectation but is it is already supply under 5v with no load even adding just the items you mentioned might be to much for it to maintain the required voltage, especally if you have a problem some were. With regards to the 3.6v being high for GPIO input your 3.3v circuits all seem to be running high according to you posted measurements so it may just be meter error. Ah, yes, you meant putting the multimeter in series with the 5v circuit, i'll try that tonight. Also i'll monitor the voltage drop and levels. maybe this is part of the problem. That may well be (one of) the problem(s). 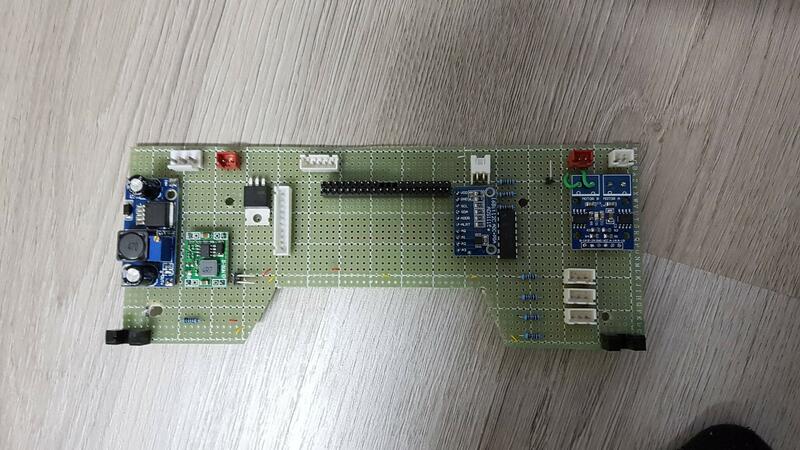 The Pi i2c (IIRC) is designed for 3V3. If another i2c board is pulling those pins to 5V, over a period of time (not predictable) the protection diodes will overheat, a problem will start and will spread (at an unpredictable rate) to other parts of the SOC. This is a case where a resistor (pulling a GPIO to 5V) was not sufficient protection for the time the fault persisted.